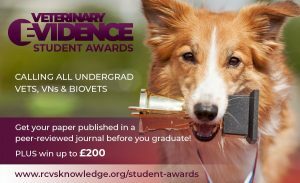 RCVS Knowledge is pleased to announce that the Veterinary Evidence Student Awards are now open for submissions! The competition is for veterinary medicine, veterinary nursing or veterinary bioscience undergraduates across the country to write a Knowledge Summary and submit it for publication in Veterinary Evidence, the open access, peer-reviewed journal of RCVS Knowledge, the charity partner of the Royal College of Veterinary Surgeons. To win one of the prizes, a submitted paper must be considered by our judges to be at a ‘publishable standard’. The deadline for submissions is 31st March 2019 and winners will be announced at our VET19 conference in June. Please see the full details of the competition for more information. This is a fantastic opportunity for veterinary students to get their work peer-reviewed and published before they graduate, while also developing invaluable academic and research skills. Category: Announcement, Blog, Events | Tagged: | Date: November 5, 2018 .